The Citrus Ridge Decorative Artists inducted our new officers for the upcoming years at our annual Christmas Party. 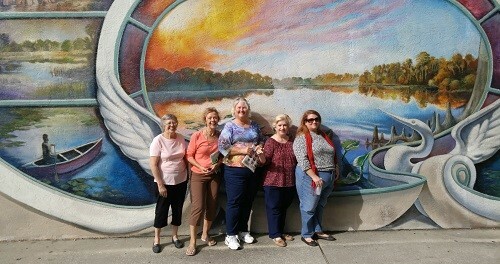 In the photo from left to right, Suzi Mills, Treasurer Bonnie Rand, Secretary Barbara Layton, 2nd Vice President and Membership Chair Barbara Fowler, President Stephanie Pooler, 1st Vice President and Seminar Chair. The Citrus Ridge Decorative Artists has on display at the Lake Wales library in Lake Wales, FL, an arrangement of artwork done by chapter members. The library invited us to share our artwork with the public and we chose to do it in the month of October, which is National Decorative Painting month. The display was up for the entire month of October.